Comcast's plans to bid for Fox are almost official. The company said Wednesday that it's preparing to top Disney's bid for most of 21st Century Fox with an all-cash offer. In a statement, Comcast (CCV) described the bid as one that will be "a premium to the value of the current all-share offer from Disney (DIS)." Although Comcast called its plans "well advanced," it cautioned that no final decision has been made. The timing of Comcast's announcement significant: Disney and Fox shareholders are soon expected to vote on their own deal. A formal offer is probably not imminent, though: Comcast is likely waiting on a judge to decide whether AT&T (T) will be allowed to buy CNN parent company Time Warner (TWC). The Justice Department sued to block that deal, citing antitrust concerns. Although this was the first time Comcast has spoken publicly about its plans, its intentions have been rumored for weeks. News that the company was talking to investment banks about usurping Disney's bid was first reported early this month. The cable operator, which owns NBCUniversal, has also eyed Fox before. 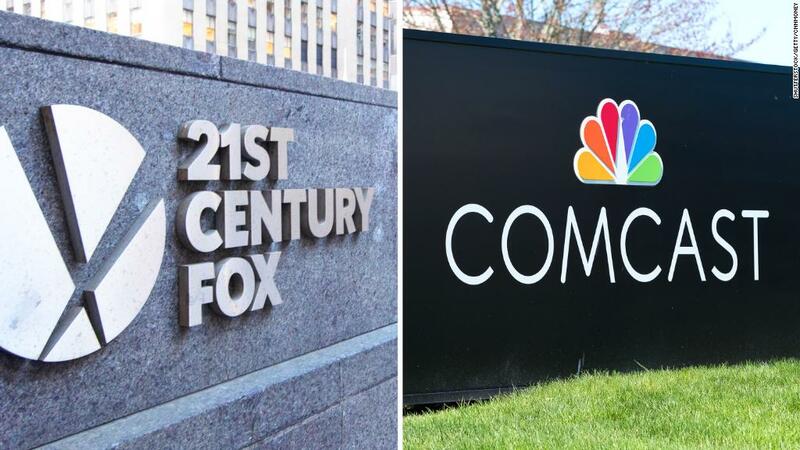 Comcast was in talks to buy the same assets last year, but lost out to Disney, in part because Fox didn't think Comcast's bid could pass regulatory muster. Disney made its $52.4 billion deal in December for Fox's movie studio and regional sports networks, as well as cable channels FX and National Geographic. The company used stock rather than cash for its bid. In its Wednesday statement, Comcast also promised Fox (FOX) shareholders that it would include a termination fee that "would be at least as favorable to Fox shareholders as the Disney offer." Comcast's decision to mention the fee is noteworthy for another reason, too. When it originally talked about buying Fox, its penalty wasn't considered big enough. Comcast did not detail the exact value of its bid Wednesday, though sources have previously told CNN that the offer would be worth about $60 billion. Fox declined to comment Wednesday. During an earnings call two weeks ago, executive chairman Lachlan Murdoch said the company would not "engage in a lot of speculation around this," though he added that Fox is "committed to our agreement with Disney." "In addition, our directors, though, of course are aware of their fiduciary duties on behalf of all shareholders," he said. The battle over Fox is emblematic of how rapidly the media industry is changing. American consumers are cutting their cable subscriptions and spending more time with online services like Netflix (NFLX), so legacy companies are looking for ways to scale their business and build influence. The battle between Comcast and Disney isn't just limited to the Fox assets either. The two have also been competing to buy the European broadcaster Sky, which operates pay-TV services in the UK and other regional markets like Germany and Italy. Disney is essentially using Fox as a surrogate in that fight. Fox, which already owns a minority stake in Sky, is attempting to purchase the rest and has agreed to sell any Sky stake to Disney as part of its acquisition. However, Comcast formalized a bid for a majority stake last month as a challenge to Fox, leaving Sky's fate uncertain. --CNNMoney's Alanna Petroff contributed to this report.